Winter is here… Whether you like it or not. 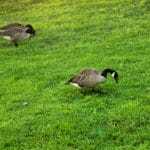 Every year, Green Lawn Fertilizing receives calls about dying lawns in the winter months. 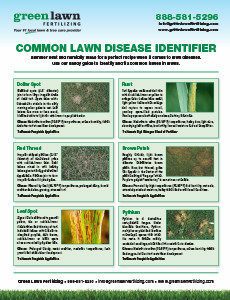 Most of the calls are regarding some type of lawn disease. While lawn disease can happen at anytime during the lawn care season, many seem to develop in the fall and early winter months. As a lawn care fertilizing company, our state-certified technicians, service managers and even general management attempt to tackle every lawn disease as it’s own individual case. Certain lawn diseases are more complex to diagnosis and treat, whereas others can easily be prevented with a Fungicide program or proper a proper lawn pH. 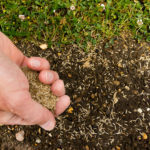 Other factors that can lead to lawn disease are: excessive thatch, low soil fertility; compacted soils, heavy prolonged dews; uncontrolled infection from the previous lawn care year and of course the unpreventable, ever changing weather patterns. Turf regions that remain wet are always prone to disease. When you consider where mold grows in your house, we can all agree it’s especially prevalent in areas that remain moist. In a couple of weeks, depending on the weather, your lawn can and will be susceptible to snow mold. According to Paul Koch from the University of Wisconsin, “Snow mold” is actually an umbrella term for several different diseases; the most common ones being pink snow mold (Microdochium patch), gray snow mold (Typhula incarnata), and speckled snow mold (Typhula ishikariensis). Koch also goes onto explain the fungi behind these types of diseases grow so slowly, doing the necessary research in winter is very difficult. 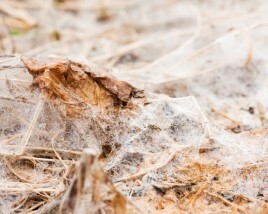 What are some things to remember when preparing for this snow mold? In the mid-Atlantic states, consumers should be ready to combat snow mold between of November through March. 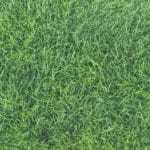 If you care for your own lawn you want to be certain remove leaves or any sort of debris that is going to trap moisture near the turf’s surface. If you do not do this, snow mold will increase and be harder to combat. Probably one of the most vital prevention methods to snow mold is your last lawn mowing. You want to make certain your last mowing is at least 2.5 to 3 inches tall. Another important aspect to snow mold is that is rarely kills turfgrass. It may look pretty bad after snow-melt, but once temperatures warm in early spring your turf will start to recover just in time for early spring lawn care! To help strengthen your lawn’s roots before winter, you’ll want to order or perform a final winter fertilizing application. You can do this yourself or call Green Lawn Fertilizing today and we will give 30% off your application! Find out the diseases that most commonly plague lawns in this region and how you can prevent them from affecting your property. 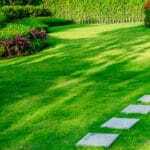 Lawns can take a beating in the summer, with hot, dry conditions and heavy foot traffic. 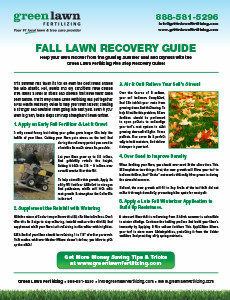 Repair damaged turf and help your lawn get ready for next year with these tips. 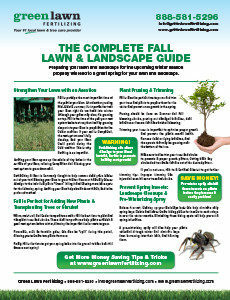 Ensure that your lawn and landscape enter next spring in peak condition with these steps. Winterize – protect your lawn over the cold, harsh months with our winter application. Get 30% off our winter fertilizing application.